David Dill and Barbara Simons have written an excellent essay about some of the risks of Internet voting and a system that is being deployed for the Democratic primary. 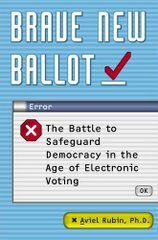 While the dangers of electronic voting with paperless DREs have been covered in great detail in this blog and in other places, the risks of voting on home computers over the Internet are significantly greater. It seems only fitting that Dill & Simons published this article on Groundhog Day. If you saw the Bill Murray movie where every day repeats as though for the first time, you’ll appreciate the way Internet voting seems to appear again in every election in a similar fashion. Dill and Simons refer to Internet voting „experiments“ as a whack-a-mole. somit wünsch ich mir selbst einen guten start ;) und haufenweise feedback von bloggern zu dem thema! Dieser Beitrag wurde unter e-voting abgelegt und mit e-voting verschlagwortet. Setze ein Lesezeichen auf den Permalink.